We love the 2016 movie, Mr. Church a lot, not just because of Eddie Murphy but also for the awesome performance of Britt Robertson as Charlie. Born as Brittany Leanna Robertson, this American Actress has expertise and acclaim in both television series and movies. She has been nominated for seven awards so far and has won three. These include the Star of Tomorrow at the 2015 CinemaCon Award, Best Supporting Actress for her role in White Rabbit at the 2014 Boston Film Festival, and Best Actress in Ask Me Anything at the 2014 Nashville Film Festival. The star was birthed in the United States of America on the 18th of April and in the year 1990. She was born in North Carolina, Charlotte to be precise and bred in Greensville, South Carolina. Her parents are Beverly Hayes and Ryan Robertson who is a Restaurateur. Britt has six younger step-siblings – three boys and three girls. She, as well as her siblings, were home-schooled due to her mother’s lack of trust towards the quality of education available in public schools. At a very young age, Britt was already in love with acting and began living the life with Greenville Little Theater located in South Carolina. When she turned 10, she appeared for the first time on screen as a younger Sheena in the 2000 movie Sheena. Lovers of the Power Rangers Time Force might have noticed her guest appearance in 2001. Currently, it’s on record that Brittny has no fewer than 49 movie credits to her name. This year (2018), she is already appearing on our television screens as Vex in Rapunzel’s Tangled Adventure and as Sandra Bell in For The People. Her astounding roles are receiving worldwide acclaim but this hasn’t always been so. Through unrelenting efforts, Britt Robertson has gone higher in the acting cadre since her debut in 2000. Other television series to her name include Girlboss (2017), Live Unexpected (2010- 2011), Law & Order: Criminal Intent (2009), Freddie (2005 – 2006) and The Winner (2007). Recent movies in which she has either starred or appeared in include The Space Between Us (2017), A Dog’s Purpose (2017), Mother’s Day (2016), Tomorrowland (2015), Cake (2014) and The Longest Ride (2015). Why not do yourself a favor, pick up some of her movies and have a blast. What’s not to love about the actress after all? The American actress has taken part in over 40 movies till date with major killer performances in a handful. She even stole the shine all to herself in some of them despite acting alongside bigger shots in the industry. It is therefore not surprising that she is credited with having an estimated net worth of $2 million. 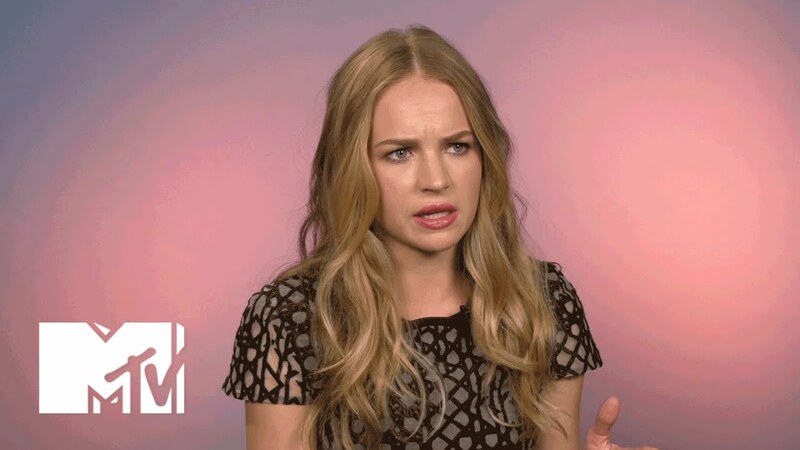 Britt Robertson has allegedly been in a romantic relationship with three persons to date. The first was Gregg Sulkin, a British actor whom she began seeing in 2010 after they met on the set of Avalon High. Allie Pennington was her character’s name in the movie. She and Gregg dated for just a brief time in 2010 before parting ways. Logan Henderson came into her life in 2011 but stayed for just a few months and the duo said their goodbyes. In 2011, while on set for the movie The First Time, Brittany set her eyes on fellow actor Dylan O’Brien or rather, he set his eyes on her. Well, whatever the case, it seemed to be a case of an instant bond. The duo has been in love, waxing strong and living the dream love life since then. But then, there’s one thing, Brittany doesn’t like Dylan coming on set to watch her act as it makes her feel shy and a bit nervous. She says the feeling is mutual too so yeah, that doesn’t count. In January 2018, rumors arose that they had split up and although neither Britt nor Dylan came up to refute or acknowledge these claims immediately, Dylan later did. Almost everyone was happy to know they were still together and going strong.